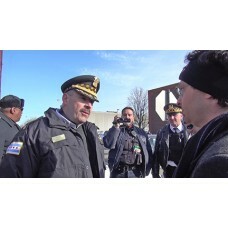 In a protest action at Chicago's Homan Square black site, about 150 people gathered on Saturday, Feb. 28, 2015 at the corner of Homan and Fillmore in Chicago. Mainstream out-of-town publications, such as the Guardian in England, recently stirred things up with articles about a police facility in Chicago disturbingly similar to CIA 'black' operations in foreign countries. Chicago-are journalist Kim Scipes (President of the Chicago local of the National Writers Union/UAW) talked about what a black site is: "A black site simply is a place that's not acknowledge to even exist...There's no oversight...it's like comparable to CIA operations in the Middle East...Somebody could be detained by the Chicago Police Department, nobody knows, it doesn't go into the central booking system, so lawyers can't find clients, clients can't get their lawyers, there's no constitutional rights. It's a total abrogation of the Constitution." Up to now, the Chicago Police Department and the City of Chicago are ignoring requests for an impartial investigation of the Homan Ave. site's operations, or for public inspections. Andy Thayer (Gay Liberation Network) said that the existence of the site was not only a moral outrage and violation of the Constitution, but a budget issue: "The City paid out $50 million plus last year alone due to police misconduct. The City in 2013 settled a class action lawsuit for $16.5 million to stop them from abusing people in the overnight lockups at the regular CPD stations. Things like sleep deprivation, things like handcuffing people to the walls of interrogation rooms for hours on end, denial of access to restrooms. So to find out that they're operating an off-the-books site here [Homan Ave.] and thus potentially setting up the city for millions of dollars more in wrongful police misconduct lawsuits is just absurd. We're a city that's swimming in red ink." Homan Square has also created a political problem in the final weeks to the April 7 runoff mayoral election between Rahm Emanuel and Chuy Garcia. Both candidates have, as of the date of the publication of this video, steered clear of saying anything about the black site. "I think it's outrageous," Thayer noted, "that [Mayor] Emanuel promised 1,000 more cops and unfortunately Chuy Garcia [the Mayor's opponent] repeated that ridiculous demand in the current race. And yet, to my knowledge neither of them have spoken out substantively about investigating Homan Square." "We specifically invited Chuy", added attorney Billy Joe Mills (Firmequity), "and he said 'no'. This is an international story and he can't be bothered to travel to the west side of his own city he wants to become mayor of to give his comments." The only run-off candidate for the 2015 election who showed up at the Feb. 28 protest, or who has expressed any support, was businesswoman Vetress Boyce, running in the 24th Ward, where the Homan facility is located. This is a multi-segment show. The video is one segment in a DVD with two or more segments. For example product code LB-701-2 means that the video is the 2nd segment of show LB-701. Ordering LB-701-2 would mean that you will be sent the DVD with all of the segments.